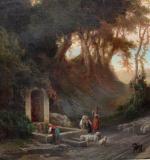 Monumental South Italian landscape with peasants by the well and sheperd with the herd on the foreground and a town by the lake on the background was executed by famous Austrian Romanticism landscape painter Melchior Fritsch (1826 Vienna - 1889 Vienna). Melchior Fritsch was renowned Austrian painter, drawer and lithographer. At first private pupil of Joseph Höger. Study: punctuation of Fine Art Academy in Vienna under Joseph Mößmer and Franz Steinfeld. 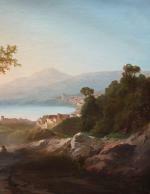 In 1845 Gold- Med., so-called Imperial Prize for a landscape and from 1851 yearly represanted by exhibitions of the Viennese art union with genre landscapes. As a painter of self-taught, formed further especially on journeys through the Alps, to Italy, South Tirol, the Middle East (Constantinople, Smyrna), to Paris and 1886 Berlin. Member of the Viennese artist union Eintracht, since 1859 of the Patriotical union Of the artists of Vienna, in 1861 Co-founder of the Vienna Künstlerhaus. 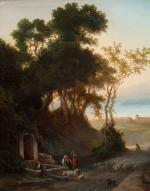 1876-84 the Austrian Emperor Franz-Josef I bought a few landscapes. (oil, Aqu) by Fritsch at the exhibition of the Vienna Art Union Künstlerhaus. 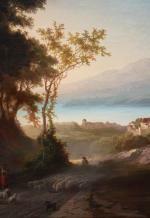 Fritsch favorite motives were late romantic landscapes, often lake motifs of the Salzkammergut area with scenery (carters, herdsmen with cows and horses). Famous also his costume-portraits (in watercolour) of famous Austrian actors ( Johann Nestroy as Willibald, lith, 1847, Vienna museum on Karlsplatz). Works by M.Fritsch situate in LINZ, province museum of Upper Austria; SEITENSTETTEN, Stifts-Gal. ; Vienna, Fine Art Academy. Exhibitions: 1867 Paris, 1873 Vienna. Literature: Thieme/Becker 2, 1916 (Lit.). Almanach der Maler und Bildhauer Deutschlands und Oesterreich-Ungarns (St.) 1:1890; Fuchs, Maler (19.Jh.) I, 1972; Erg.-Bd I, 1978. – Schmidt, 1951; B.Heinzl, Jb. des Oberösterr. Museal-Ver. 24:1979, 126; R.Waissenberger, Schau-Slg (K HM), W. 1984; GG der ABK in Wien. Ill. Bestands-Verz. (K), W. 1989; Thiemann-Stoedtner, 1989; L.Schultes, Die Slg Kastner (K Oberösterr. LM), II, Linz 1996 (Lit. ); M.Mayrhofer (Ed. ), Stifts-Gal. Seitenstetten (K), Seitenstetten [ca. 1998]; Aichelburg I.1, 2003; Dorotheum (Aukt. ), W. 21.6.2004. – Online: Öl-Gem. und Aqu., 19.Jh. (Aukt. Dorotheum), W. 22. Measurements: unframed w 43 1/2" x h 30 7/8" (110,5 x 78,5 cm), framed w 52 3/4" x h 40 1/8" (134 x 102 cm).